'Oba Oba' (Mary Dunn, R. 1991). Seedling# M84-925. TB, 35" (89 cm). Midseason bloom. Standards white ground stitched rosy magenta purple, almost solid edge; falls white ground, rosy magenta stitching almost to edge; beards whitish, yellow deep in throat; ruffled. 'Momentum' X Ghio seedling# 77-70: 'Premonition' sibling x 'Mystique' x 'Barletta')). 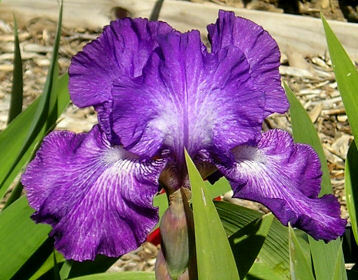 MAD Iris 1992. Honorable Mention 1994. From AIS Bulletin #285 April 1992 Introducing OBA OBA (Mary Dunn) Sib to Envogue, a real brassy showoff. Purplish grape fancy with white lines on falls and white on standards and midribs. Heart of flower light, pale beards, wide, lightly ruffled. $30.00. M.A.D. Iris Garden. JPG ObaObaSI.JPG manage 330 K 18 Apr 2019 - 23:02 Main.TLaurin Photo by Sandy Ives.